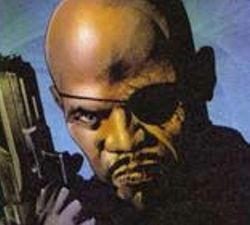 Just last week, it seemed like Samuel L. Jackson was never going to don the black eye patch ever again. Now, The Hollywood Reporter has revealed that the actor has agreed to a nine movie deal with Marvel Studios in which he will continue to play Col. Nick Fury for quite some time. Details about the deal, which was signed late last week, are now becoming public. Jackson will reprise his role as the director of the secret ops organization S.H.I.E.L.D. in next year’s Iron Man sequel. Jackson’s deal includes an option to star in a Marvel Studios Picture of his own. However, that project may be a long time coming, as the actor has already been cast to play Fury in a number of projects Marvel has scheduled over the next few years. Other Marvel projects Jackson has been linked to include next year’s Thor feature film and the long anticipated Avengers movie due sometime in 2011. Marvel has plans to link all of its movie franchises into a single cohesive universe like the company has done in the comics. By signing Jackson to what critics are calling a “contract to play Nick Fury for life,” Marvel has taken the first step to laying a complex foundation never before seen in film.